You have found an independent source of information, rare in a commercially dominated world. No adverts here, just good ideas on what you can do in New Zealand to conserve globally-valuable resources such as vehicle fuel and fresh water, seek a healthy lifestyle and perhaps trim some household expenses. Use the tabs to see each topic introduced. Then go on to downloads (in PDF format) to read much more, once you have registered. 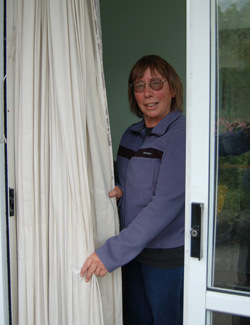 Margaret joined the Sustainable Living course to see what more she could do to save on heating and power costs. She already knew about double glazing and fitting linings to curtains (as pictured), so was ready to explore new actions such as timers on radiators, fridge efficiency improvements and more. Sustainable Living endorsed her early actions and helped her, with her daughter, to take more actions, going well beyond changing lightbulbs! She became more confident to take action and competent when doing them, as a result of what she learned and discussed in the group. What are you doing already? You've perhaps made a good start, but it's time to take stock and learn some more! The publications are virus-scanned, quite detailed and illustrated. They include web-links to other information providers but no advertising. Get them free from here once you have registered in a participating or 'member' district or city; or you can pay a $39 one-year access fee for a personal password if your council is not yet a member. They are published as PDF files, for which you will need to use the well-trusted free Adobe Acrobat Reader software, if it is not already installed. Read the guides on-screen or you can save the PDF to your computer for later reference or for printing. 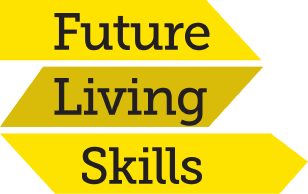 You can share them with your local Future Living Skills class/study group but as they are copyright material, may not re-publish or sell them. We know that many people prefer learning in a group setting, with discussion, so the learning guides are written to help you to host or take part in a study group. There are supporting materials such as slide sets and group activities in the downloads area, too. Give them a try! 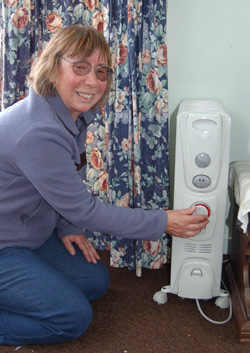 Margaret uses a thermostat and a timer on her oil-filled radiator to control exactly when it turns on and off, so that this room is warm before she arrives, without wasting electricity. Sometimes getting the right technology is a better investment for comfort and efficiency, than relying on remembering to turn heaters on and off. Checking that your current retailer is best value in your area. Try SwitchMe website or Glimp. Note that there may be cost penalties if you switch provider more than once a year! Keep lids on cooking pans and pots; don't over-fill the electric jug - it takes lots of power to make steam, and then more for a fan to vent it from the room! If rooms are overheating in summer, shade the West-facing windows instead of running an invertor heat pump as cooling. Dry clothes outside on lines instead of in a dryer. The UV light helps kill bugs too but may also fade some colours. Close curtains at dusk in winter to keep warmth in, and have them wide open on north-facing windows by day. Ventilate bathrooms and kitchens to outside, to remove steam - dry air is easier and cheaper to warm than wet air, and you reduce mould too. Modern extract fans are power-efficient and bathroom fans can be run on delayed auto-switch off. For many more possible actions, and details of how to select small investments in equipment or materials that will pay for themselves (such as where to spend first on home insulation) see our Energy learning guide, You have to be registered in a member city or district first, or be an individual subscriber in non-member districts, which supplies you with a password. The one password covers all the topics. Your place might be a unit in a row, an old villa, a modern city apartment or a small rural eco-house (like this MasterBuilders award-winning Canterbury example) but whatever your type of home, the best opportunity to consider sustainability comes when it is renovated, repaired or designed from new. Design that minimises waste and toxins during construction, decoration and in later use. Our learning guide on eco-building and renovation takes you through some key steps and builds your confidence and know-how, ready for when you meet the trades people and builder. We help you to think about the whole system of the house, not just add expensive gadgets that a sales rep has promoted, regardless of your needs. First you have to be registered in a member city or district, or become an individual (9 month) subscriber, which supplies you with a free password. All topics are covered by the one password. 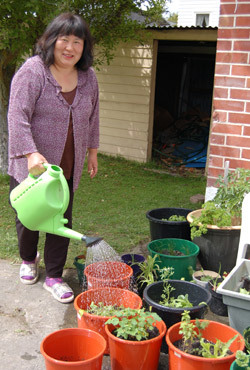 Sustainable Living course participant Ruby liked herbs and Asian salads, and in summer she knows they need plenty of water (more than the Mediterranean herbs) so she waters her pots by hand several times a week. Although water covers 71% of the earth’s surface, less than 3.5% of this is fresh, salt-free water and much of it is frozen in glaciers and ice-caps, leaving only 1% globally as potential drinking water in streams, lakes and in underground reserves. Much of this ‘fresh’ water is inaccessible to people or has become too polluted for use without treatment. Very few NZ homes collect and store rainwater - more could do so. Did you know that we only drink around 5% of the water we use? The other 95% goes down the drain from showers, taps, laundries and toilets, as well as use in gardens (BRANZ Auckland water use study, 2008). Consider using dripper or porous hoses to irrigate favourite garden beds in preference to using sprinklers, and let lawns stop growing in mid summer - it is unnatural for grass to be bright green colour then! For more sophisticated water-saving and efficiency ideas, storage, gardening tips, grey water use options and recipes for DIY cleaning materials, see the Water learning guide, 2017 edition available soon to download free in participating cities/districts.You have to be registered in a member city or district first, or an individual subscriber, which supplies you with a password. All topics are covered by the one password. 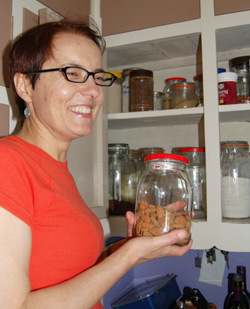 Sustainable Living course participant Lisa re-used empty glass jars with lids, for food storage. "Beats throwing them away, and reduces my need for new plastics" she says, "and I try to grow some food at home too". Food choices have a much larger impact on the planet than we may realise. The energy required to produce, process, pack and transport some foods is huge, but their labels don't usually help alert us to this and origin is often obscure; we need independent background information. Refusing a carrier bag at the checkout is the easy part, de-coding the labels and seeing through greenwash claims is harder! Read more in the Sustainable Living learning guide on Food. You have to be registered in a member city or district first, or an individual subscriber, which supplies you with a password. All topics are covered by the one password. 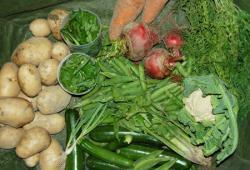 Take a look also at our organic veges action page, using tabs above. 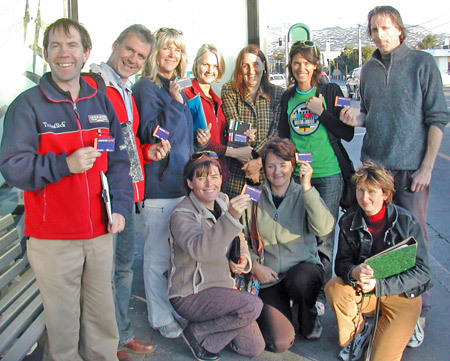 These happy travellers, presenting their Christchurch Metro travel cards, were Sustainable Living class members about to hold an evening class on the Orbiter bus, as it made a circuit of the city suburbs. They debated alternatives to the car on the journey, and took a break half-way round at a cafe, finishing the circuit before 9pm (at no extra fare). For some it was their first bus trip for years! If the whole group had gone out cycling instead the experience would have been novel for many, too. We are so used to using cars in NZ, for even the short trips of under 2km that could easily be walked or cycled. Rising fuel prices are beginning to erode that habit, but change is too slow to reverse the country's rising carbon emissions from transport. NZ is way behind Europe in this respect. Keep tyres correctly inflated. Instructions may be inside door frame, or ask your supplier. Walk for short trips when there's not much to carry - leave the car parked, as short trips maximise wear on the engine. Note that drivers are exposed to traffic fumes as much as pedestrians: fewer cars on less congested roads helps everyone. Diesel engines are the most polluting in city streets. To learn more such tips and begin changing your carbon footprint from driving and flying; also about Global Peak Oil and the climate implications of burning the already-identified oil and coal reserves, read the detailed Sustainable Living travel and carbon guide, which can be downloaded from this website, once you are registered - free if you live in a member council area or you can be an individual subscriber for a modest fee. Here's a January day's harvest, from a Sustainable Living tutor's garden: potatoes, courgettes, peas, cauli, Mesclun salads, beetroot and carrots. All were compost-grown organically without chemical sprays or fertilisers. Converting sunny lawn areas into cropping spaces. Veges can be decorative and fashionable too: think French style Potager! making raised beds on areas where existing soil is damp or unsuitable surface such as concrete. Bartering your surplus, or preserving it, in exchange for what neighbours grow. Organic growing has always been one of the most popular Sustainable Living/Future Living Skills topics. To download your copy you first need to be registered via your district/city page, or be an individual subscriber to get your password. All topics are covered by the one password. Lisa avoids waste. She's a recycler as well as a cyclist. 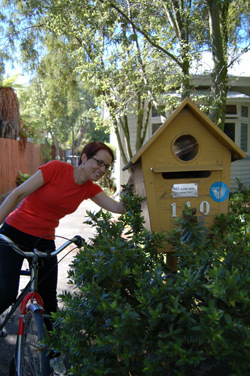 This early Sustainable Living course participant had already labelled her mailbox 'NO junk mail' when she started the course, but learned lots more about how to avoid buying stuff destined early for landfill, about re-using and recycling. Matthew Luxon, one of the 'Rubbish Free Year' pioneers, was also a Sustainable Living participant. He has edited and updated our waste minimisation topic, to ensure we can offer great advice and practical information. "About 93% of the raw materials used by humans get thrown away during manufacture and then 80% of the stuff we buy is thrown away after one use. New Zealanders throw away more rubbish per person than in most other developed countries." says Matthew, "It need not be that way. We reduced our throw away to landfill for a full year to just one carrier bag's content. Everything else was either avoided, or re-used or recycled or composted. No, it was not easy, but we learned lots!" There is much more, plus video links and websites available to help your quest to reduce waste at home and work, in the revised edition of our waste minimisation learning guide here, once you have registered at the appropriate district/city page or become an individual subscriber. All topics are covered by the one password. How well would you manage if the heating was off and the supermarket closed. Would you be able to boil water, make leaf tea (pehaps even from your own dried herbs) and keep a teapot warm in a cold room? 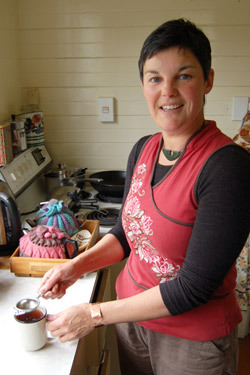 Sharon would - she survived Christchurch earthquakes and had also learned skills from the Sustainable Living course, which has a 'community resilience' topic alongside the more obviously environment-themed ones. In 2011, Cantabrians found there is much common ground between the skills of self-reliance after emergency and sustainability. In the year before 2010, two communities in Christchurch (plus some in Auckland) trialled this eighth topic in our series, designed to complement the advice of NZ Civil Defence. Course participants in Sumner and New Brighton subsequently reported that it was really useful to have thought and prepared for water storage, food growing and preserving at home, house insulation, emergency cooking, sharing skills and produce with neighbours; even keeping a bicycle in road-ready condition. It helped them survive the tumultuous weeks following the city's series of big earthquakes. Being more sustainable was also more disaster-resilient. To use the community resilience learning guide you will need to have registered first - do this just once at your member city/district page or be an individual subscriber. One password (sent by email) covers access to all topics.